While I recognize what having Bruce Springsteen at the festival did for the Fest, having some of his fans there was unbearable. We wanted to see Marc Broussard, Allen Toussaint, and Voice of the Wetlands. The Springsteen fans were unbearably loud throughout all the performances, to the point that you could not hear. When I asked some people to be quiet so I could hear “Louisiana Sunshine” I was told that I “could hear them any night for five bucks” and that “Andrew” Osborne plays everywhere all the time. We left after VOW. It was sad that those fans had no respect for the other performers. Over on the Jazz Fest chat board, we talk about those kinds of folks, and we even have a term for them: chatting fuckwits, or CFW’s! Enclosed is the associated lagniappe my wife and I gave out during the Fest this year. Use it in good (mental) health! The following is in response to the letter of Mr. Marcello Amari [Letters, May 2014].—ed. First, as I understand the Foundation’s mission, “expanding the horizons” of any Jazz Fest attendee (“drunken frat-boys and girls, boomer tourists and their bratty offspring”) or not, is precisely the reason both it and the Fest were created, regardless of whether that attendee wishes to see Afoxé Omô Nile Ogunjá, Bruce Springsteen, Cee-Lo Green, the Eagles, etc. In other words, no attendee is deemed more superior than another based upon who they care to see perform—all attendees are equal in the eyes of the Fest. Furthermore, music of Springsteen, Cee-Lo, the Eagles, etc. are no less salient than that of Ogunjá, or any other performer, as, according to the Festival’s website, “the [Fest] celebrates the indigenous music and culture of New Orleans and Louisiana, so the music encompasses every style associated with the City and the State” blues, R&B, gospel, Cajun, zydeco, Afro-Caribbean, folk, Latin, rock, rap, country, bluegrass and everything in between.” That pretty music covers everything from Ogunjá to Springsteen, Cee-Lo, the Eagles, etc. and back again. Second, some attendees are admittedly ill mannered as a result of imbibing too many alcoholic libations, talking loudly during a performance, etc. ; however, this is, after all, a “festival” venue and not an intimate, private performance—accept it, just as the performers apparently have. As a final thought, I cannot imagine how inconsequential the Woodstock Music & Art Fair of 1969 (a.k.a. Woodstock) would have been on past, present and future generations of all nations had attendance been restricted to adults; had all attendees been sober at all times; and had festival officials and/or performers hushed the crowd during performances. The Fest, as it exists today, is one of the most successful approaches to exposing all, whether they be fans of Ogunjá and/or “drunken frat-boys and girls, boomer tourists, and their bratty offspring” to the diverse food, culture, and music of Louisiana, New Orleans and, arguably, the world. May your future experiences at the Fest be positive, enlightened ones. As a part-time resident of New Orleans for 36 years, Jazz Fest is and has always been one of the highlights during my spring stay. I had great times at the Fair Grounds and was out there from early morning enjoying the fabulous music. But it could have been perfect if it was not for the dreaded sub-woofers of all the amplification systems in the big tents and stages. I don’t know what these “soundmen” are doing, thinking or hearing. From the audience point of view, all one can hear is the sub-bass frequencies of the bass drum and bass. They are ear hurting and are very uncomfortable. No band ever sounds like that when it plays acoustically or on a CD, and isn’t the point of a sound system to just amplify the real and natural sound of a band. These sub-bass frequencies are so loud that they drown out all the other music above 100Hz and even throw off the sense of pitch for the song because the human eardrum cannot cope with the strong low frequency movement and at the same time distinguish the finesse in the rest of the sound spectrum. It was the same at Jazz Fest 2013 and partly also at the French Quarter Festival. The one and only exception I heard last year was the concert of Wayne Shorter—a strong but beautifully clear and well-balanced sound in the WWOZ/Jazz Tent. It sounded just like a top-level CD. My guess is that Mr. Shorter had his own soundmen at the mixing board. It is possible to produce a good sound in a tent for 3,000 or so listeners. Please someone out there, save the music and get rid of all low-level bass amplifications. At the end of March, we spent a couple of enjoyable days in New Orleans (we love Frenchmen Street). We also rented a car and took a Cajun-country road trip to Lafayette, Eunice and Mamou. At Marc Savoy’s Music Shop, we had the pleasure to listen to a jam including Zach Fuselier (what a talent) and a number of young musicians. Fantastic. We’ll be back soon. OffBeat welcomes letters from its readers—both comments and criticisms. To be considered for publication, all letters must be signed and contain the current address and phone number of the writer. Letters to the editor are subject to editing for length or content deemed objectionable to OffBeat readers. 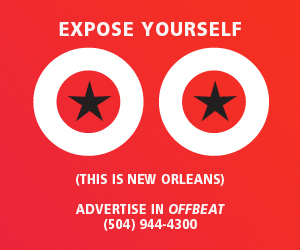 Please send letters to Editor, OffBeat Publications, 421 Frenchmen St., Suite 200, New Orleans, LA 70116.